I was at Theodore Roosevelt area and got two new birds for my year list, Blackpoll Warbler and Gray-cheeked Thrush. At that time I couldn't carry camera around because I broke my arm few weeks ago, but I got some good views so that I didn't mis ID it with Veery or Swainson's. Gray-cheeked Thrush was on a trail and I had planty of time to observe this guy. He had plain gray face and almost no eye ring and had more heavily spotted breast than other thrushes. 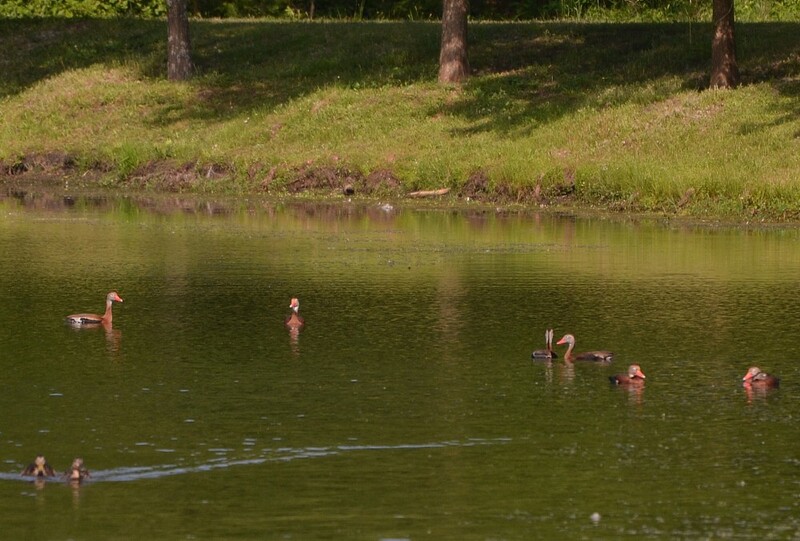 Dave did let me know about Perdue Pond Black-bellied Whistling Ducks. It was pretty easy to get them with my broken arm, just drive by and mark them down. I counted 22 of them. Looks like each year these ducks become more and more common. They really expanding their area. 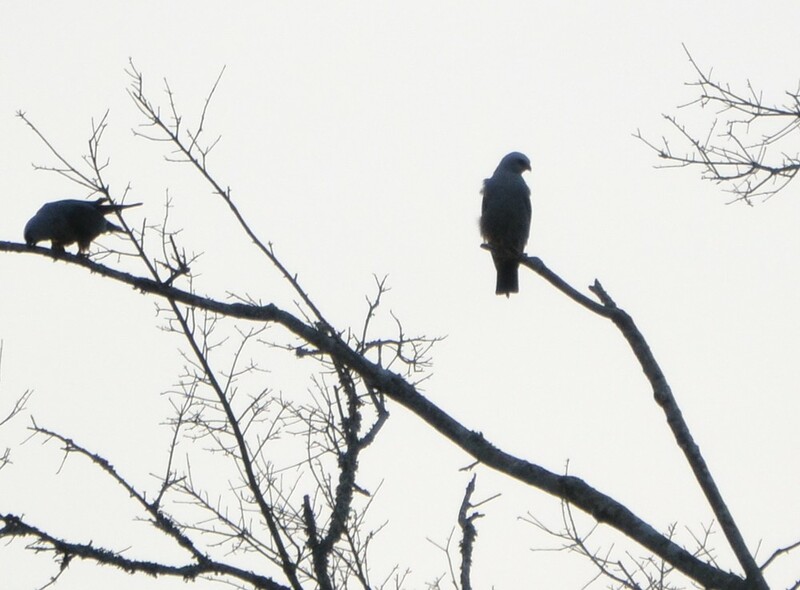 The same night I visited Dave to check out the Mississippi Kites. Two of them were staying on the tree near his house. I got some closeup views. 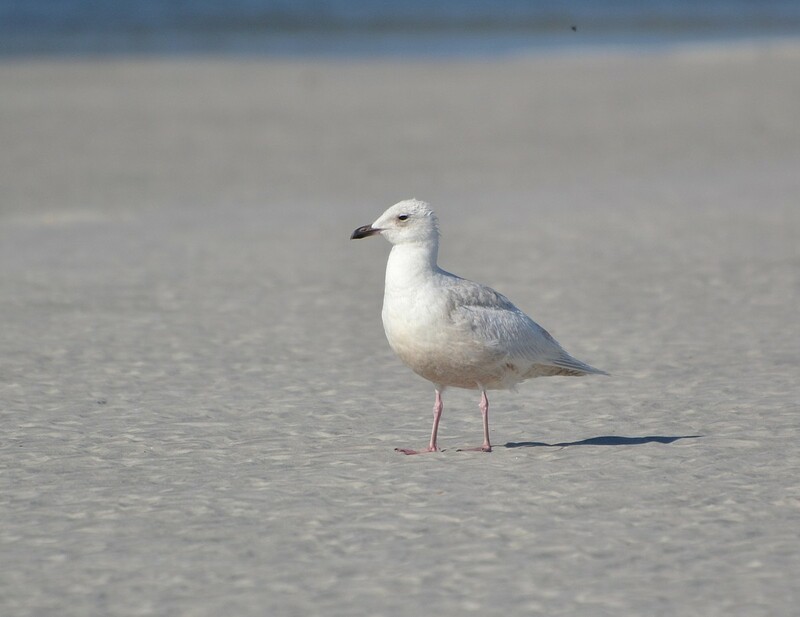 About few weeks Iceland Gull was seen at Huguenot Park, but the bad news is that I couldn't find this bird. 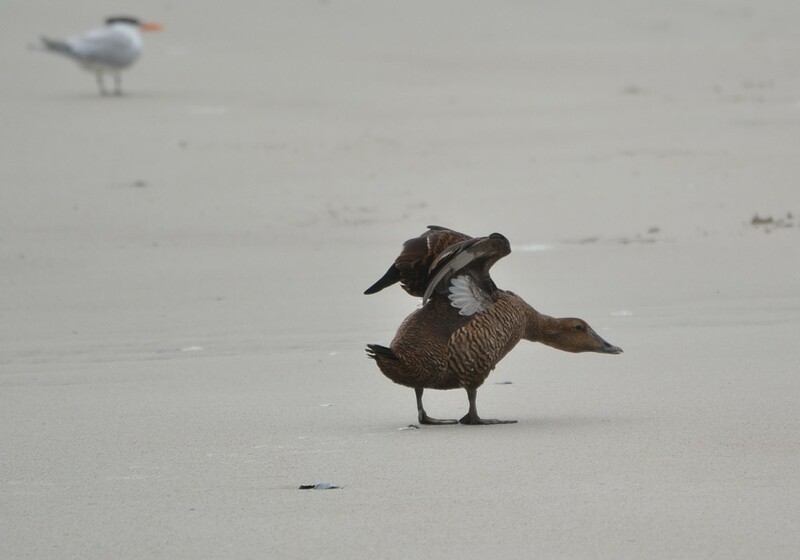 Every time I chased it the gull was nowhere to be found. Although I could not locate the Iceland Gull I got some other year birds instead, Common Tern and Semipalmated Sandpiper. 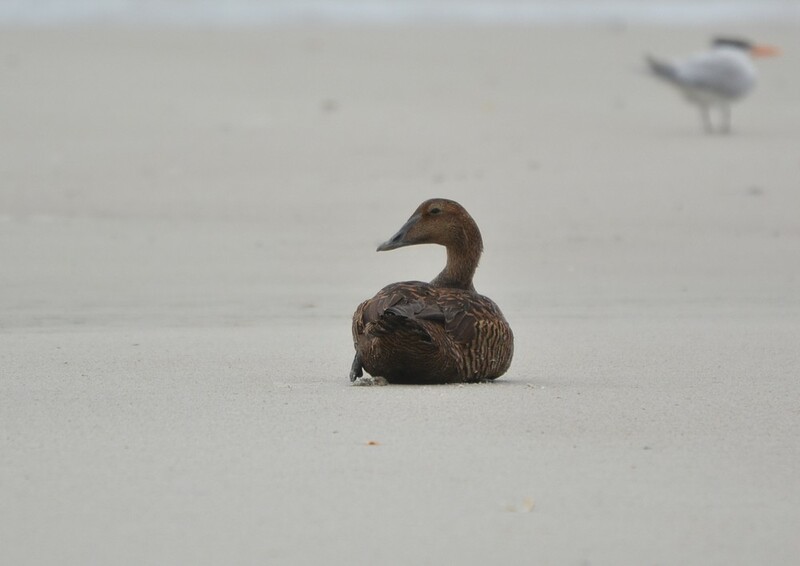 I found even Common Eider resting with gulls and pelicans. That was a good find. Last one I think was seen in Duval County couple of years ago. One day I missed the Iceland Gull about 5 minutes. Kevin sent me a message that Iceland is here, but it took off right before I got there. I started to feel already that this bird becomes my Nemesis bird, everyone else has seen it except me. Following day I was back in Huguenot park again to check all the usual spots, but couldn't find again. I was just about to leave but decided to check out a last part of the park, and there it was - white gull with pink legs and dark bill, this was an Iceland. It took me six times to chase it, but it paid off. I got some nice close up views without disturbing him too much. Common Nighthawk was seen around already for some time. One night I took extra time to wait for sunset at Theodore Roosevelt Area and got it to my list. Last and the best bird was found at M&M Dairy field May 22'nd. 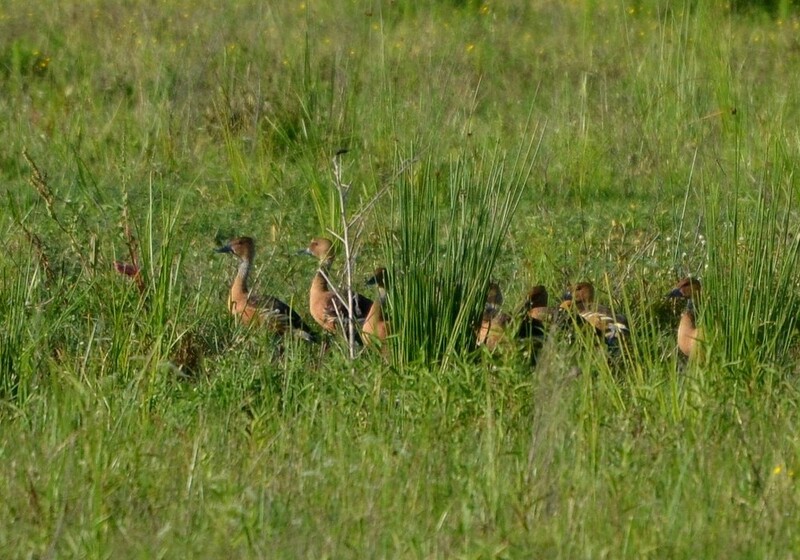 I got ebird alert about Fulvous Whistling-Ducks and went to check it out. I found them on the dairy field looking for food. There were 8 of them. I sent message to Kevin and Dave. Dave was on a way right away but Kevin was out of town and was dying about that. He said "I can't believe I'm missing this out", but luckily ducks were not hurry to leave, so that next day Kevin was able to see them too. There are only two historic eBird records in Duval couty about Fulvous Whistling-Ducks, back in 1971 and 1976, that was a good find. This May I saw 10 new year birds. This brought my list up to 215 species for this year. This is actually about the same as last year at the same time.